The meeting which lasted only four minutes helped Mr Kejriwal "unlearn" some important lessons. 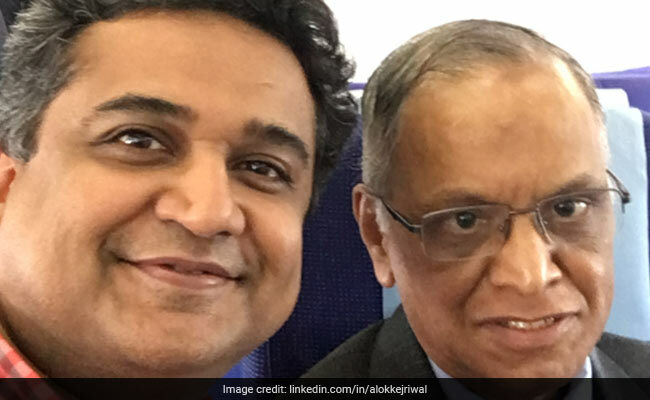 It is not every day that one learns important lessons from the founder of Infosys, Narayana Murthy. Alok Kejriwal, CEO & Co-founder of Games2win tweeted about an unexpected run-in with Mr Murthy which happened a year ago and had a deep impact on him. The meeting which lasted only four minutes helped Mr Kejriwal "unlearn" some important lessons. Describing the chance meeting, Mr Kejriwal said that he and his wife saw Mr Murthy walk into a flight travelling from Mumbai to Bangalore. Mr Kejriwal whispered to his wife, "Isn't that Narayan Murthy?" Before she could answer, the Infosys-founder looked at him and said, "Yes". Being an admirer, Mr Kejriwal walked up to him and offered his seat. To which Mr Murthy smiled and said, "No thanks. I am very happy. Thank you." While Mr Kejriwal was star-struck, his wife casually told him that she had in fact spotted Mr Murthy a while back on the bus to the plane but did not mention it to him as Mr Murthy was sleeping at that time. Why was Mr Murthy not flying his own plane? Why was he in IndiGo? Why wasn't there a posse of airline people following him? If I was him, Boy! I would have my own Jet and crew and all that jazz, Mr Kejriwal thought, and realized that "being special is not what (some) great men enjoy." Sometimes 'special VIPs' need to be accommodated and insist upon sitting in the first row or business class. Mr Murthy was just being a normal guy, Mr Kejriwal said. No fuss, no special favors asked. Lesson unlearnt? Being accommodative is a blessing. Being authoritative is a curse. Mr Murthy did not act famous or expected others to notice him. Nor did he demand a special treatment from the flight crew. Lesson unlearnt? Being famous comes from being exceptional. Not by expectations, said Mr Kejriwal. When Mr Kejriwal asked his wife why she did not tell him when she saw Mr Murthy earlier, she said that the Infosys founder was sleeping and she did not want to disturb him. Lesson unlearnt? Being silent is the dividend you earn when you are centered. "Both Narayana Murthy and Chhavi (Mr Kejriwal's wife) were silent then. Why was I making such a noise?" Mr Kejriwal realized.